The ecological impacts of agricultural intensification and change in Europe since the Second World War are well documented and affect both agricultural areas and their surrounding systems . Biodiversity, air and water quality and soil structure of ecological systems have all been affected . Well-documented impacts of agricultural development include: widespread negative effects of the application of nutrients in fertilisers (mineral and organic) and agro-chemicals on soil, and surface and ground water quality ; emission of N2O as a potent greenhouse gas ; negative effects of pesticides on non-target invertebrate species , birds  and biological control potential ; and loss of ecological heterogeneity at multiple spatial and temporal scales . The establishment and management of vegetated strips (including field margins, buffer strips and hedgerows) are key mitigation measures for these negative environmental impacts . Here, we define vegetated strips as any vegetated area set-aside from the main cropping regime within or around a field, and installed for the purposes of benefiting native biota, water and air quality, socio-economics, and yield. Examples of such interventions include: hedgerows, field margins, buffer strips, beetlebanks and shelterbelts (Fig. 1). For the purposes of this review, we focus on those interventions that are permanent or semi-permanent fixtures in agricultural landscapes, and the interventions must therefore be in place for longer than 12 months (see inclusion criteria for further details). Vegetated strips may have a multi-functionality that covers a range of processes, including protection of water quality in surface waters and soil conservation of slopes, habitat improvement, biodiversity, shading, carbon sequestration, flow capture, biomass production, landscape diversity, and societal services . These processes occur through a set of pathways that impact socio-economic and environmental outcomes (Fig. 2). Many of the ecosystem services provided by some vegetated strips exist because of a reduction in water flow that occurs due to soil properties induced by the strip and the presence of roots and above-ground vegetation. As surface runoff passes across field margins, the velocity of shallow uniform flow tends to decrease in response to the type and density of strip vegetation as well as any decrease in slope. This reduction in flow velocity allows suspended sediment to be deposited, which decreases the transport of sediment and sorbed nutrients and other contaminants beyond the strip. Strips with perennial vegetation, such as grasses, trees and/or shrubs, can counter soil erosion via filtration of larger sediment particles [11, 12], and by increasing soil stability through increased root density . The reduction in flow velocity also provides potential for infiltration of water into the strip, decreasing the total volume of runoff water and the associated load of dissolved contaminants; this process is controlled by the infiltration capacity of the soil and vegetated strips are known to modify this soil parameter relative to adjacent agricultural land . The effectiveness of vegetated strips in reducing sediment transport off-site is known to vary with the ratio of runoff area to the area of the strip  as well as with other factors including soil type, topography, soil–water management (such as drainage pipes), land use, rainfall intensity and antecedent moisture conditions . For instance, heavy rainfall may cause fast preferential flow where nutrients and pollutants readily flow from the soil surface through macropores, cracks and root channels into drainage pipes, particularly in dry clay soils . In addition to soil cracking, high water repellence of old vegetated strips with a mossy soil surface may enhance preferential flow or surface runoff thus increasing the potential for erosion on steep slopes under dry soil conditions . In these kinds of situations, vegetated strips are not effective in retaining soluble or particle bound nutrients. Any condition that promotes the formation of channel flow (rather than sheet runoff) will reduce the flow reduction and sediment capture [e.g. 19]. This can be associated with steepness of slope, local topography and/or intensity of rainfall. 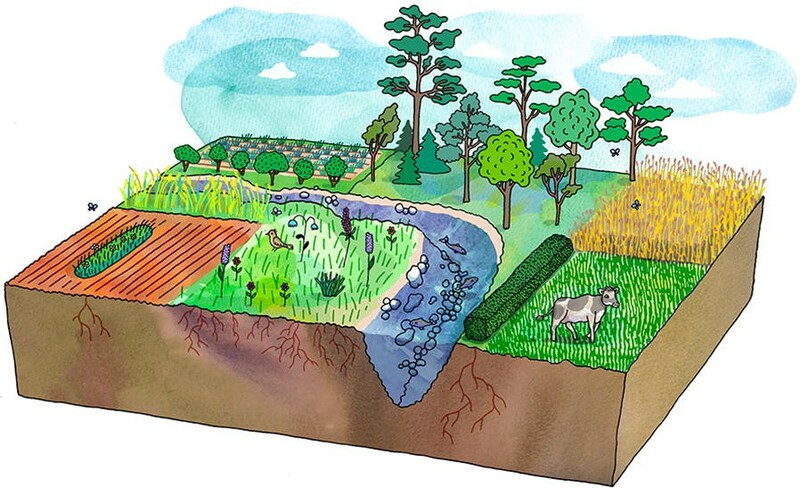 Gully formation caused by concentrated flows in agricultural fields can be hindered by grassed waterways. The grassed waterway outlet is kept wide and shallow to slow the velocity of water and spread the flows evenly before entering a vegetated strip . Similarly, the beneficial flow reduction properties of vegetated strips can be negated where the strip occurs on steep ditch banks. In such cases, the design of ditch banks or implementation of two-stage ditches may improve planting of banks and flow reduction properties. Nutrients and pesticides are amongst the most important pressures on aquatic ecosystems, where excess inputs may deteriorate ecosystem integrity and/or threaten drinking water resources [21, 22]. Even strongly-sorbed compounds, including faecal pathogens from livestock or slurry fertiliser applications, can harm surface water quality through runoff. Vegetated strips at the field margin are one of the most commonly applied management measures, and are mainly designed and implemented to control sediment, phosphorus, nitrogen and pesticide losses to off-site surface waters [23, 24]. They have been shown to be highly efficient for reducing nutrient runoff from farmed fields in a wide range of climatic regions across the world [19, 25]. Vegetated strips in riparian zones can also remove nitrogen in proximity to watercourses, particularly subsurface nitrogen, although their effectiveness appears to be less than for sediment or sediment bound contaminants . The efficiency of vegetated strips in reducing dissolved phosphorus is dependent on the dynamic equilibrium between soil and dissolved phosphorus. Phosphorus is adsorbed by soil when the phosphorus concentration in soil water is higher than the equilibrium level and vice versa . Generally, the effectiveness of vegetated strips in controlling transport of soluble contaminants is less than for strongly-sorbed chemicals because the reduction in water transfer across the buffer is generally smaller than the reduction in sediment transfer . There is also potential for dissolved contaminants infiltrating into the margin to reach surface water subsequently via subsurface drains and/or shallow groundwater. In some circumstances, vegetated strips may change from a nutrient trap into a nutrient source. For example, phosphorus may be desorbed from the deposited soil particles and soil surface or liberated from the frost-broken plant cells in vegetated strips during heavy rainfall events or spring runoff [19, 29]. To cycle the nutrients assimilated by the plants, vegetation in vegetated strips should be harvested and plant waste removed from strips . Where contaminants may be emitted to the air, as for pesticide spraying, vegetated strips have a dual functionality in increasing the distance between the emission source and vulnerable habitats such as surface waters or non-crop habitats, but also through the potential for interception of spray drift. Finally, it is known that pharmaceuticals used in animal husbandry may also be important contaminants of terrestrial environments adjacent to agricultural fields [e.g. 30]. In such cases, vegetated strips can again increase distance from source for operations such as spreading of manure and biosolids, as well as having potential for interception of airborne particulates at time of spreading. 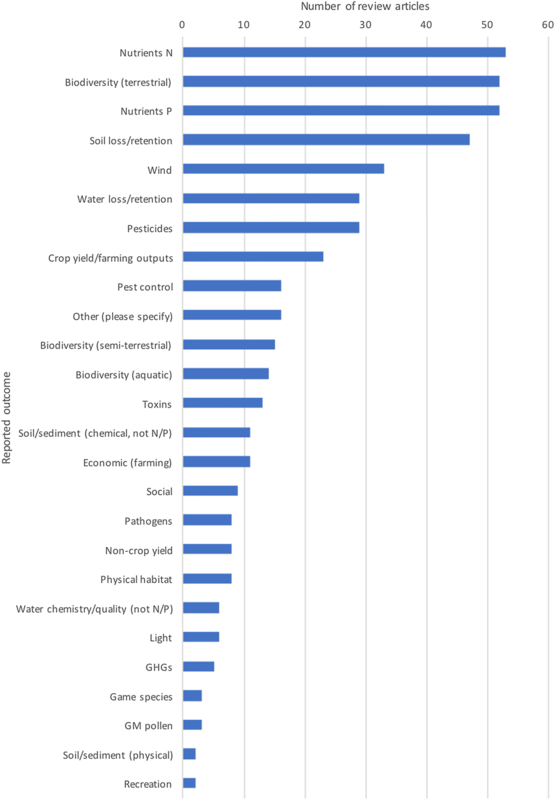 The widespread loss of spatial landscape heterogeneity, associated with the cultivation of a few high yielding crop types across large uniform fields , is often viewed as a key driver of biodiversity loss on arable land [31–34]. Hence, the creation and management of vegetated strips such as field margins have the potential to restore habitat diversity for the benefit of associated farmland biodiversity . Hedgerows and other field margin vegetation types have been shown to affect the richness and abundance of flora, invertebrates and birds [36–38]. For instance, grassy field margins have been shown to provide important refuge and food for invertebrates, mammals and birds [39, 40]. Yet, these effects may depend on landscape structure and regional levels of agricultural intensification . As a result measures are sometimes implemented in landscapes where their effects are small or even negative for some species . As vegetated strips comprise a variety of different vegetation types that are managed for different purposes, their effects on biodiversity and associated ecosystem services may vary. For instance, pollinator habitat enhancement in the form of hedgerows and flower-rich strips may contribute to yield on adjacent fields , but also overall biodiversity and biological control potential in the surrounding landscape . Vegetated strips established using densely planted perennial grasses may primarily benefit invertebrates for pest suppression , but also increase the availability of suitable nesting sites for ground-foraging farmland birds on adjacent crop fields . At the regional scale these benefits may be particularly valuable in resource-poor landscapes . In addition, both at local and regional scales, vegetated strips provide valuable linear habitats that may promote connectivity between areas of non-agricultural land or semi-natural landscapes . Finally, vegetated strips around and within fields may also impact on crop production. Field margins can support beneficial invertebrates such as natural enemies of pest invertebrates, but also may harbour weeds, pests and diseases (e.g. viruses), which could potentially create a conflict between crop production and biodiversity conservation [9, 49, 50]. Increased habitat heterogeneity may also have negative impacts on some migratory (grass-eating) species (e.g. geese) or farmland species such as skylarks that rely on the cropped area of large fields, for breeding and foraging [51, 52]. For these species, homogeneous environments, commonly considered to be the result of agricultural development and intensification, may represent preferred habitat equivalent to permanent grassland ecosystems in central and eastern Europe . Depending on the nature of their management, vegetated strips can provide various other services. Some resources from vegetated strips can be harvested periodically, such as wood and fodder . Strips are also used to provide nesting and foraging habitat for game bird populations [e.g. 54], although elevated mortality and nest predation can occur in these habitats [55, 56]. A less well-studied aspect of vegetated strips is their potential to enhance aesthetic values and perceived “naturalness” of agricultural landscapes, especially when vegetated with trees and/or shrubs and employed in areas where such features are absent . Similarly, other values may include amenity use of agricultural land, for example by horse riders. One key question relating to vegetated strips as an environmental intervention on farmland is how to evaluate multifunctional effects; that is, impacts of single strips on multiple outcomes. True evaluation for areas larger than the plot-scale is difficult to undertake due to difficulties in having representative controls. One possibility to overcome large-scale evaluation problems is therefore upscaling of plot results and/or modelling, and in both cases collection of data from experimental studies conducted around the world will be invaluable as a baseline. In their review of the multifunctional role of vegetated strips on arable farms, Hackett and Lawrence  concluded that although different strip types can produce multiple benefits, none can wholly provide for all environmental outcomes. One way to optimise multiple benefits from field margins at the field and landscapes scale could therefore be to adjust management practices locally according to purpose. Cresswell et al. used systematic mapping to identify which plant traits deliver different ecosystem services to help inform future plant community design of vegetative strips. In reality, many vegetated strips vary in their purpose, method of establishment and ongoing management. Common forms include those that are naturally regenerated from unused farmland, those sown with grass or wildflower mixes, those sown specifically for target organisms such as pollinators (nectar and pollen mixes) or for wild birds (seed mixes), those that are annually cultivated and those that are unmanaged . The specific design and management of a vegetated strip may depend on the main reason for the intervention, and the resultant efficacy for the different outcomes described above may vary accordingly. Wildflower strips, for example, are designed to benefit pollinators such as bees , whereas densely vegetated strips typically established by sowing a mixture of perennial grass species adjacent to water courses, are primarily used to mitigate soil erosion  and reduce runoff of nutrients and agro-chemicals . The access to foraging opportunities for insectivorous birds in strips designed for water protection may be substantially lower compared to strips planted with wildflower mixes  or naturally regenerating strips on poor soils with a diverse seed bank . Accordingly, managing vegetated strips for biodiversity or for diffuse pollution purposes may entail very different management practices, since retained dissolved or particulate matter eventually accumulates within the strip, which in turn may reduce the potential for biodiversity benefits. However, removal of plant material from vegetated strips could help maintain long-term retaining capacity, avoiding their transformation into nutrient sources, and with simultaneous benefits of lower nutrient levels and/or sparser vegetation for wild flora and visual foragers such as birds . An additional consideration in this context relates to pollution swapping , where mitigation measures for one pollutant cause an increase in another pollutant. In this way, vegetated strips for controlling nitrogen leaching could lead to simultaneous transformation of sediment-bound phosphorus into soluble reactive phosphorus. Whilst a large volume of evidence is known to exist on these varied impacts of vegetated strips around and within agricultural fields, and whilst various literature reviews have sought to examine their impacts for specific outcomes [e.g. 26, 64–66], no review has systematically collated evidence on their impacts, certainly not across multiple diverse outcomes. Here, we report on the results of a comprehensive systematic mapping of all available evidence relating to the impacts of vegetated strips within and around fields in boreo-temperate regions. The topic was suggested at a general stakeholder meeting arranged by MISTRA EviEM on September 24th, 2012. Suggestions for the topic were made by the Swedish Board of Agriculture, the Swedish Environmental Protection Agency, the Swedish Ministry of the Environment, Svensk Sigill, Hushållningssällskapet, WWF, and researchers from the Centre for Biodiversity and the Department of Ecology at the Swedish University of Agricultural Sciences. The focus and scope of the review was narrowed and better defined during a specific stakeholder event on September 1st, 2015. Details of this meeting and the modifications in scope are available on request. Stakeholders who attended this event were invited to comment on the draft protocol prior to submission for publication, although none did. Stakeholders were not engaged during the conduct of the review. The aims of this review were to identify, collate, and describe relevant published research relating to the effectiveness of vegetated strips in and around farmland for a wide variety of purposes, including but not limited to: the enhancement of biodiversity; the reduction of pesticide and nutrient drift/runoff/leaching; the mitigation of soil loss; the reduction of pathogens and toxins; and, socioeconomic values, such as provision of game habitat and reduction of crop pests. The map is restricted in geographical scope to boreal and temperate systems (see inclusion criteria below), and this report is accompanied by a searchable database describing the identified relevant studies, and an evidence atlas, an interactive, web-based geographical information system (GIS) displaying the contents of the database. What evidence exists regarding the effects of field margins on nutrients, pollutants, socioeconomics, biodiversity, and soil retention? To what extent has this research focused on multi-use vegetated strips? Vegetated strip interventions around and within fields used for crop production (arable), grazing and horticulture, orchards and vineyards, where presence of a vegetated strip or management of the strip is investigated. Before vegetated strip establishment, before a change in vegetated strip management (temporal comparisons); no vegetated strip, different vegetated strip management, including strip width (spatial comparisons); outside a vegetated strip. All and any outcomes were included iteratively as they are identified within the relevant literature and were coded accordingly. The methods described herein reflect those outlined in the published protocol . Our methods deviate from the protocol only in adding a number of organisational websites to our search strategy, including a database of review articles as an additional output, and our inability to screen and code a small number of articles in German and Swedish due to a change in availability of the German and Swedish speaking review team member. AGRIS: agricultural database (FAO) (http://agris.fao.org/agris-search/index.do). Directory of Open Access Journals (http://doaj.org/). Web of Science Core Collections (http://wok.mimas.ac.uk/). Index to Theses Online (http://www.theses.com/). The following search string was used as a basis for searches within each of the above databases and was adapted using database-specific syntax as appropriate (see Additional file 1). Searches in bibliographic databases were performed on 13/11/15 and have not been updated during the conduct of the review. (“*grass barrier*” OR “grassed barrier*” OR “grassy barrier*” OR “managed barrier*” OR “riparian barrier*” OR “sown barrier*” OR “uncropped barrier*” OR “un-cropped barrier*” OR “unmanaged barrier*” OR “unploughed barrier*” OR “un-ploughed barrier*” OR “vegetated barrier*” OR “vegetation barrier*” OR “vegetative barrier*” OR “forest barrier*” OR “forested barrier*” OR “noncropped barrier*” OR “non-cropped barrier*” OR “plant barrier*” OR “planted barrier*” OR “*flower barrier*” OR “wood barrier*” OR “wooded barrier*” OR “woody barrier*” OR “herbacious barrier*” OR “cultivated barrier*” OR “uncultivated barrier*” OR “bird cover barrier*” OR “grazed barrier*” OR “weedy barrier*” OR “weeded barrier*” OR “perennial barrier*” OR “*grass border*” OR “grassed border*” OR “grassy border*” OR “managed border*” OR “riparian border*” OR “sown border*” OR “uncropped border*” OR “un-cropped border*” OR “unmanaged border*” OR “unploughed border*” OR “un-ploughed border*” OR “vegetated border*” OR “vegetation border*” OR “vegetative border*” OR “forest border*” OR “forested border*” OR “noncropped border*” OR “non-cropped border*” OR “plant border*” OR “planted border*” OR “*flower border*” OR “wood border*” OR “wooded border*” OR “woody border*” OR “herbacious border*” OR “cultivated border*” OR “uncultivated border*” OR “bird cover border*” OR “grazed border*” OR “weedy border*” OR “weeded border*” OR “perennial border*” OR “*grass boundar*” OR “grassed boundar*” OR “grassy boundar*” OR “managed boundar*” OR “riparian boundar*” OR “sown boundar*” OR “uncropped boundar*” OR “un-cropped boundar*” OR “unmanaged boundar*” OR “unploughed boundar*” OR “un-ploughed boundar*” OR “vegetated boundar*” OR “vegetation boundar*” OR “vegetative boundar*” OR “forest boundar*” OR “forested boundar*” OR “noncropped boundar*” OR “non-cropped boundar*” OR “plant boundar*” OR “planted boundar*” OR “*flower boundar*” OR “wood boundar*” OR “wooded boundar*” OR “woody boundar*” OR “herbacious boundar*” OR “cultivated boundar*” OR “uncultivated boundar*” OR “bird cover boundar*” OR “grazed boundar*” OR “weedy boundar*” OR “weeded boundar*” OR “perennial boundar*” OR “*grass buffer*” OR “grassed buffer*” OR “grassy buffer*” OR “managed buffer*” OR “riparian buffer*” OR “sown buffer*” OR “uncropped buffer*” OR “un-cropped buffer*” OR “unmanaged buffer*” OR “unploughed buffer*” OR “un-ploughed buffer*” OR “vegetated buffer*” OR “vegetation buffer*” OR “vegetative buffer*” OR “forest buffer*” OR “forested buffer*” OR “noncropped buffer*” OR “non-cropped buffer*” OR “plant buffer*” OR “planted buffer*” OR “*flower buffer*” OR “wood buffer*” OR “wooded buffer*” OR “woody buffer*” OR “herbacious buffer*” OR “cultivated buffer*” OR “uncultivated buffer*” OR “bird cover buffer*” OR “grazed buffer*” OR “weedy buffer*” OR “weeded buffer*” OR “perennial buffer*” OR “*grass filter*” OR “grassed filter*” OR “grassy filter*” OR “managed filter*” OR “riparian filter*” OR “sown filter*” OR “uncropped filter*” OR “un-cropped filter*” OR “unmanaged filter*” OR “unploughed filter*” OR “un-ploughed filter*” OR “vegetated filter*” OR “vegetation filter*” OR “vegetative filter*” OR “forest filter*” OR “forested filter*” OR “noncropped filter*” OR “non-cropped filter*” OR “plant filter*” OR “planted filter*” OR “*flower filter*” OR “wood filter*” OR “wooded filter*” OR “woody filter*” OR “herbacious filter*” OR “cultivated filter*” OR “uncultivated filter*” OR “bird cover filter*” OR “grazed filter*” OR “weedy filter*” OR “weeded filter*” OR “perennial filter*” OR “*grass margin*” OR “grassed margin*” OR “grassy margin*” OR “managed margin*” OR “riparian margin*” OR “sown margin*” OR “uncropped margin*” OR “un-cropped margin*” OR “unmanaged margin*” OR “unploughed margin*” OR “un-ploughed margin*” OR “vegetated margin*” OR “vegetation margin*” OR “vegetative margin*” OR “forest margin*” OR “forested margin*” OR “noncropped margin*” OR “non-cropped margin*” OR “plant margin*” OR “planted margin*” OR “*flower margin*” OR “wood margin*” OR “wooded margin*” OR “woody margin*” OR “herbacious margin*” OR “cultivated margin*” OR “uncultivated margin*” OR “bird cover margin*” OR “grazed margin*” OR “weedy margin*” OR “weeded margin*” OR “perennial margin*” OR “*grass strip*” OR “grassed strip*” OR “grassy strip*” OR “managed strip*” OR “riparian strip*” OR “sown strip*” OR “uncropped strip*” OR “un-cropped strip*” OR “unmanaged strip*” OR “unploughed strip*” OR “un-ploughed strip*” OR “vegetated strip*” OR “vegetation strip*” OR “vegetative strip*” OR “forest strip*” OR “forested strip*” OR “noncropped strip*” OR “non-cropped strip*” OR “plant strip*” OR “planted strip*” OR “*flower strip*” OR “wood strip*” OR “wooded strip*” OR “woody strip*” OR “herbacious strip*” OR “cultivated strip*” OR “uncultivated strip*” OR “bird cover strip*” OR “grazed strip*” OR “weedy strip*” OR “weeded strip*” OR “perennial strip*” OR “*grass zone*” OR “grassed zone*” OR “grassy zone*” OR “managed zone*” OR “riparian zone*” OR “sown zone*” OR “uncropped zone*” OR “un-cropped zone*” OR “unmanaged zone*” OR “unploughed zone*” OR “un-ploughed zone*” OR “vegetated zone*” OR “vegetation zone*” OR “vegetative zone*” OR “forest zone*” OR “forested zone*” OR “noncropped zone*” OR “non-cropped zone*” OR “plant zone*” OR “planted zone*” OR “*flower zone*” OR “wood zone*” OR “wooded zone*” OR “woody zone*” OR “herbacious zone*” OR “cultivated zone*” OR “uncultivated zone*” OR “bird cover zone*” OR “grazed zone*” OR “weedy zone*” OR “weeded zone*” OR “perennial zone*” OR “barrier strip*” OR “border strip*” OR “boundary buffer*” OR “boundary margin*” OR “boundary strip*” OR “boundary management*” OR “field border*” OR “field buffer*” OR “field margin*” OR “buffer strip*” OR “buffer zone*” OR “filter strip*” OR “filter zone*” OR “managed edge*” OR “buffer management*” OR bufferstrip* OR bufferzone* OR “cropland buffer*” OR “farmland buffer*” OR “farmland margin*” OR “ditch bank*” OR “farm buffer*” OR “farm edge*” OR “farm interface*” OR “field bank*” OR “field boundary*” OR “field edge*” OR “field interface*” OR “filter margin*” OR “filter strip*” OR filterstrip* OR “filter zone*” OR filterzone* OR “margin strip*” OR beetlebank* OR “beetle bank*” OR “hedge row*” OR hedgerow* OR shelterbelt* OR “shelter belt*” OR “grassed waterway*” OR “grassed water way*” OR “grass waterway*” OR “grass water way*” OR “grassy waterway*” OR “grassy water way*” OR “vegetated waterway*” OR “vegetated water way*” OR “vegetative waterway*” OR “vegetative water way*” OR “wind buffer*” OR “agroforestry buffer*” OR “conservation buffer*” OR “conservation headland*” OR “conservation head land*” OR “stream border*” OR “stream barrier*” OR “stream buffer*” OR “stream margin*” OR “river border*” OR “river barrier*” OR “river buffer*” OR “river margin*” OR “waterway border*” OR “waterway buffer*” OR “waterway margin*” OR “water way border*” OR “water way buffer*” OR “water way maring*” OR “countour strip*” OR “nectar strip*” OR “widlife strip*” OR “wildlife corridor*” OR “set-aside margin*” OR “set-aside border*” OR “set-aside buffer*” OR “setaside margin*” OR “setaside border*” OR “setaside buffer*” OR “permanent strip*” OR “permanent margin*” OR “permanent border*” OR “permanent buffer*” OR “sterile strip*”) AND (“agro-ecosystem*” OR agroecosystem* OR agricult* OR agronom* OR arable* OR crop* OR cultivat* OR farm* OR field* OR grassland* OR “grass land*” OR horticult* OR meadow* OR orchard* OR plantation* OR ranch* OR vineyard* OR pasture* OR cattle* OR graz*). Search terms were identified through a scoping process. Firstly, we generated a list of 120 articles known by the review authors to be relevant to the topic. The titles, keywords and abstracts were then subjected to textual analysis to identify the most frequently occurring words. Key terms were then selected from this list and added to a pre-existing list generated by the review authors. Key terms were then used to probe the titles and keywords of articles in the above list to identify common co-locators (i.e. words located next to key terms in the text). Common pairs (i.e. any pair of words that frequently occur together in the corpus) were also identified. All key terms were then assembled and tested both individually and in combination. Terms that resulted in very large numbers of results but that were also subjectively assessed as having low relevance (i.e. the terms ‘vfs’, ‘bz’, ‘bzs’, ‘fbz’) were excluded from the final search string. Searches for grey literature were performed in two key ways (in addition to the searches as part of the bibliographic database searches above; i.e. thesis databases and Scopus). Firstly, searches were conducted using an extensive (i.e. downloading and assessing the first 1000 results) title-only search of Google Scholar (https://scholar.google.ca/intl/en/scholar/about.html), which has been proven to return a high percentage of grey literature (c. 37%; ). 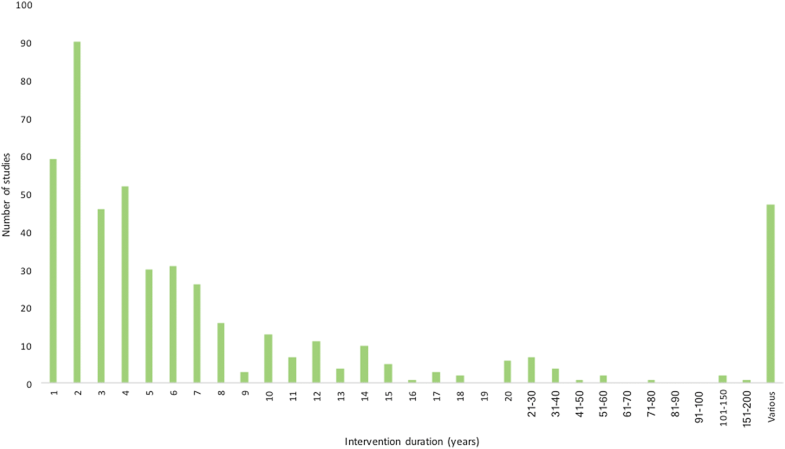 Searches were conducted for a range of key intervention search terms that individually returned more than 100 search results in Web of Science during scoping. Details of these searches are provided in Additional file 1. Searches were performed in English, French, Spanish, Swedish, German, Finnish and Danish. Only the first 1000 results are viewable within Google Scholar due to restrictions in the search engine, but these records were downloaded into a database for later screening using the method outlined in Haddaway et al. .
Secondly, searches of 43 websites of key organisations were undertaken (see Table 1). For each of the websites, web scraping was employed where possible to search for key terms using the built-in search facility using the software Import.io (http://www.import.io). See Haddaway et al. for a detailed description of the web-scraping methods used. Where automatic web-scraping could not be used due to incompatibility with the website, searches were performed, and results recorded by hand using the built-in search facilities on each site. Additional file 2 outlines the terms used for each website. The results from all searches across all databases were combined into one database for each language and screened by a review team member with relevant language expertise. The comprehensiveness of results of the above searches was tested by comparing a predefined test list of 114 studies against the combined results to ensure all of these relevant studies are found. This checking was performed iteratively at the start of the searching process. In addition, bibliographic checking was performed by screening the reference lists of 96 relevant reviews that were identified during screening of search results to retrieve any potentially relevant studies missed by the search strategy described above. Following feedback on our original search string, we performed an additional search to include records mentioning the term ‘riparian buffer’ in all bibliographic databases. This supplementary search was conducted on 21/12/15. All articles identified through searching were screened for eligibility at title, abstract and then full text levels using predefined inclusion criteria (detailed below). Consistency in the application of the inclusion criteria was tested by comparing agreement between two reviewers at title, abstract and full text level screening, using a subset of records. All disagreements were discussed. The level of agreement was tested formally using a kappa test , and where agreement score fell below 0.6, indicating moderate agreement, a third reviewer was consulted and a further set of records screened following discussion of disagreements. Consistency checking results were as follows: title level, n = 149 kappa = 0.66; abstract level first test, n = 200 kappa = 0.46; abstract level second test, n = 205 kappa = 0.82; full text level, n = 50 kappa = 0.62. Following abstract screening, potentially relevant studies were retrieved in full text. Unobtainable articles are listed in Additional file 3. All screened full texts that were excluded from the review are listed along with exclusion reasons in Additional file 4. During screening, relevant reviews were placed into a separate database for coding (see below). This coding of reviews was restricted to English language reviews only, due to resource constraints. 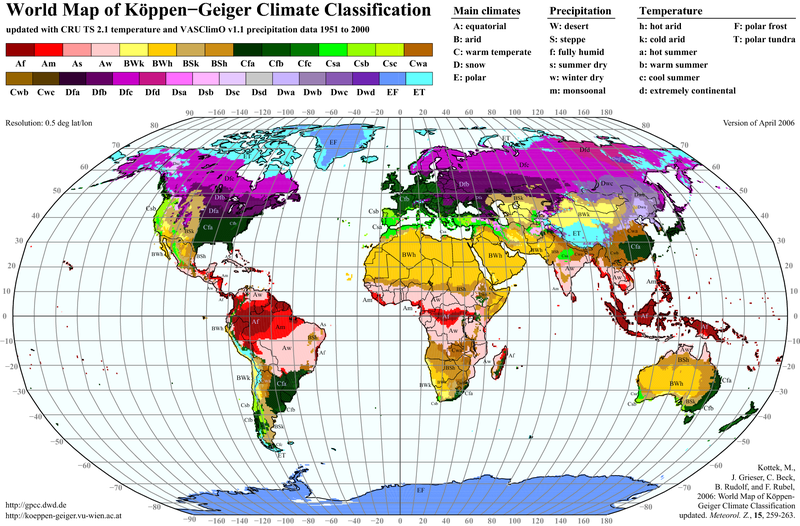 Boreo-temperate regions as defined by the following Köppen-Geiger climate classification zones : Cfa [warm temperate]; Cfb and Cfc [maritime temperate or oceanic]; Csb [dry summer or Mediterranean]; Csc [dry summer maritime subalpine]; Dfa [hot summer continental]; Dfb [warm summer continental or hemiboreal]; and, Dfc [continental subarctic or boreal (taiga)]. Vegetated strip interventions in or around fields used for arable, grazing and horticulture, orchards and vineyards, where presence of a vegetated strip or management of the strip is investigated. Outcomes were included iteratively as they were identified within the relevant literature and were coded accordingly. All social and ecological outcomes were included, such as: terrestrial and aquatic biodiversity (including connectivity); nutrient runoff or leaching; pesticide runoff, leaching or drift; soil retention; socioeconomics. Primary research studies involving field-based experimental manipulations and observations. Interventions must have been in place for 12 months or more. Management interventions within fields that are applied to existing crops (such as cover crops, intercropping, etc.) were not considered. Furthermore, only direct evidence of the impacts of vegetated strips were included in the map: i.e. not indirect evidence, such as the ability of a border species grown elsewhere to alter an outcome. Modelling studies were included where they provided primary data. Laboratory studies were not included. 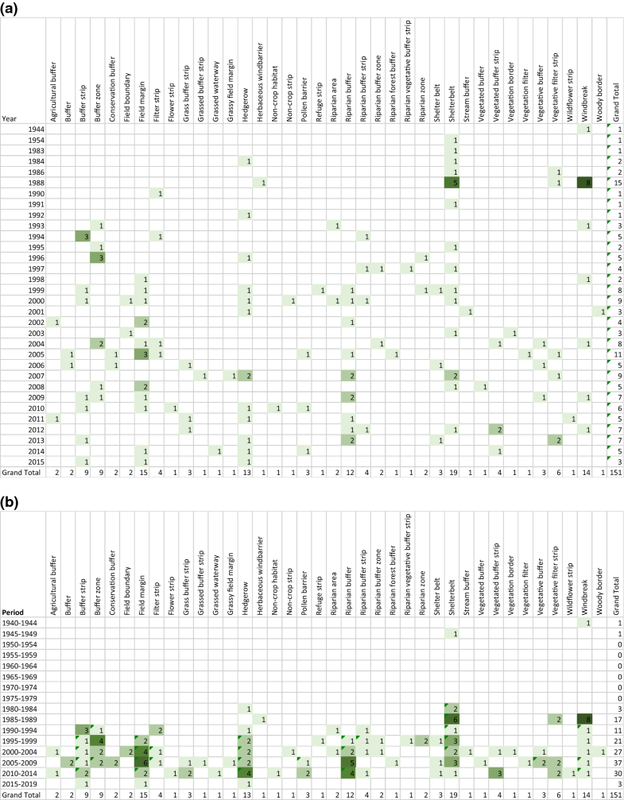 Relevant reviews and meta-analyses were recorded in a separate database. All languages were included where possible. Studies in languages not able to be translated were included in a separate supplementary database. Efforts were made to ensure that authors of research studies included in this review were not involved in any decisions regarding their own work. For Finnish studies, however, this was not possible, and JUK was involved in screening a small number of studies for which she was an author. Studies were further checked for relevance by NRH following screening, however, and no articles were included that did not meet the review’s inclusion criteria. Critical appraisal was not undertaken within this map, since the measurement methods and study designs varied substantially across different outcomes. A very basic quality assessment was conducted in the form of a ‘free text’ meta-data variable where a brief description of the study quality was made for some studies where appropriate, flagging up clearly unreliable research that should be excluded from further synthesis, and serious deficiencies that should be pointed out in those studies that remain in the map. Meta-data (i.e. descriptive data regarding the methods and setting of each study, provided as free text) were extracted from included, relevant studies and entered into a searchable database: one database was produced for primary research studies and another for relevant reviews. The database was populated with a number of variables, each given a category according to a predetermined strategy (also known as coding). This database forms one of the main outputs of the review and is supplied herein as a Additional files 1, 2, 3, 4, 5, 6, 7, 8 and 9. During meta-data extraction, each study will be assigned codes corresponding to the ecosystem services explicitly mentioned. The list of ecosystem services was adapted from Cork et al. , adding a code for ‘pest regulation’ as a regulating service. Consistency of data extraction across team members was assessed by double checking a subset of studies between two reviewers (NRH and JE). Where meta-data were missing from articles this was stated as “not reported”/“not stated”, since making efforts to obtain these data was not possible within the resources allocated to this project. Coding and meta-data was extracted for relevant reviews identified during screening using the schema provided in Additional File 5. This database is provided as an interactive, searchable database in a Additional files 1, 2, 3, 4, 5, 6, 7, 8 and 9 (see "Results"). Key variables were described in the form of tables and figures. Multiple variables were cross-tabulated in heat maps that display the volume of evidence across two categorical meta-data variables. In addition, we have summarised the relevant evidence identified in the form of an evidence atlas, an interactive geographical information system (GIS), that maps studies by their location across a cartographical map. This evidence atlas is published on the EviEM website (http://www.eviem.se/en/projects/Buffer-strips/). Knowledge gaps (subtopics that are un- or under-represented in the evidence base) and knowledge clusters (subtopics with sufficient numbers of studies to allow meaningful synthesis) were identified by the review team by cross-tabulating key meta-data variables in heat maps. Specific, arbitrary cut-offs (described in the Results text and legends of each heat map in tables, below) were used to identify poorly studied topics. The team discussed all knowledge gaps and clusters, including those that they felt were of key relevance to decision-makers and readers. No prioritisation was performed, and gaps and clusters are displayed in order of the volume of evidence. Figure 4 displays the flow of articles and studies through the systematic mapping process. From over 31,000 search results there were 19,457 unique records that were then screened on title, with 8094 abstracts screened in the next stage. Some 3000 articles remained for full text screening , although 1123 of these (37%) could not be found or accessed (see Additional file 3). 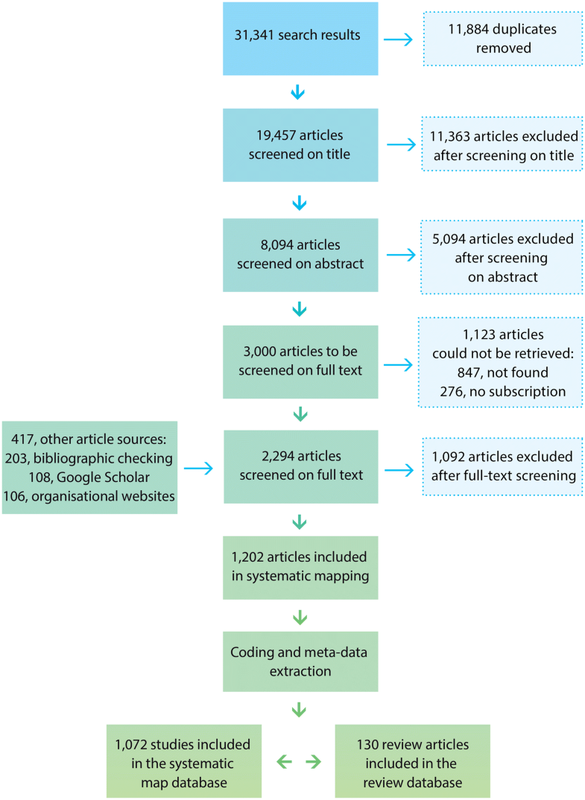 A total of 417 potentially relevant articles were added in for full text screening from bibliographic checking, and from searches of Google Scholar and organisational websites. Following full text screening, 1089 articles were excluded (see Additional file 4 for exclusion reasons). This left a final set of 1072 studies reporting primary data relevant to the review in the systematic map database (see Additional file 6), and a further 130 review articles within the review article database (see Additional file 7). Due to resource constraints, we were unable to screen German or Swedish articles at full text, which left 26 potentially relevant articles unscreened (see Additional file 8). We have produced an evidence atlas (see Fig. 5 for a screenshot and visit http://www.eviem.se/en/projects/Buffer-strips/) that displays the studies in the primary research systematic map database visually on a cartographic map. This map is interactive and allows the user to search for specific evidence both using a visual interface and a text search facility. A small number of studies (n = 8) could not be displayed on the map because they lacked information about sample location (including country). A wide variety of different terminology was used to describe vegetated strips across studies in the systematic map (Fig. 6). The most commonly used terms were ‘field margin’ (n = 152), ‘hedgerow’ (n = 146), ‘shelterbelt’ (n = 80), ‘riparian buffer’ (n = 73), and ‘buffer strip’ (n = 55). Table 2 lists the terms that were used only once. In total, across the 1072 studies in the systematic map database there were 205 different terms relating to vegetated strips that were used a total of 1220 times (multiple terms within some articles). In comparison, there were 360 search terms in our search string. However, of these, only 84 search terms were represented in articles within the systematic map database. Thus, sources of articles other than the formalised database searches (i.e. bibliographic searching) were a vital methodological addition to ensure we captured any article using some of the other 121 terms and none of the 84 search term synonyms. Additional file 9 includes a table of the primary vegetated strip terms (first, main mention) used across different field study locations, indicating, for example, that ‘riparian buffer’ is most common for US studies (n = 52), whilst ‘field margin’ is most common in the UK (n = 66). 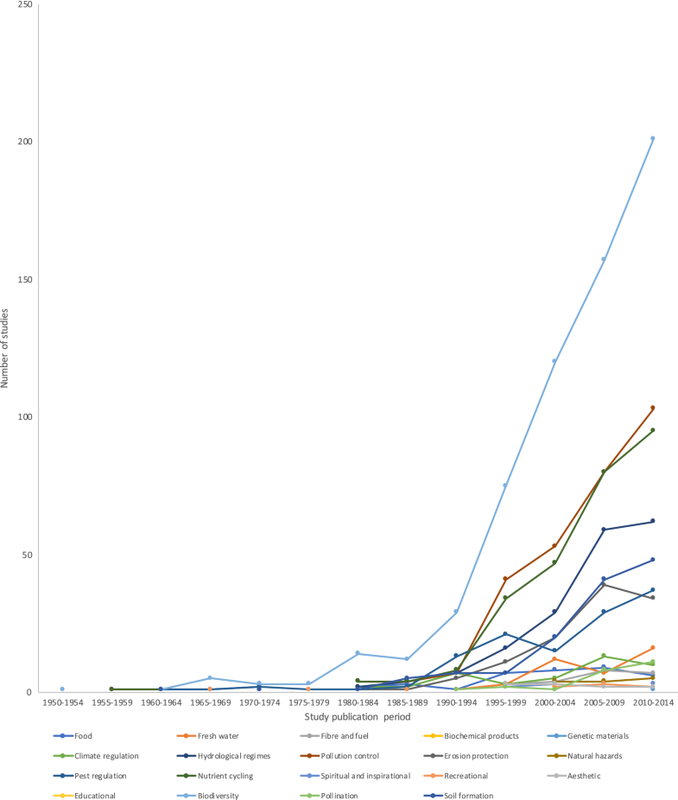 Figure 7 displays the number of relevant research studies published per year from within the systematic map database. Currently the publication rate is approximately 70 studies per year. 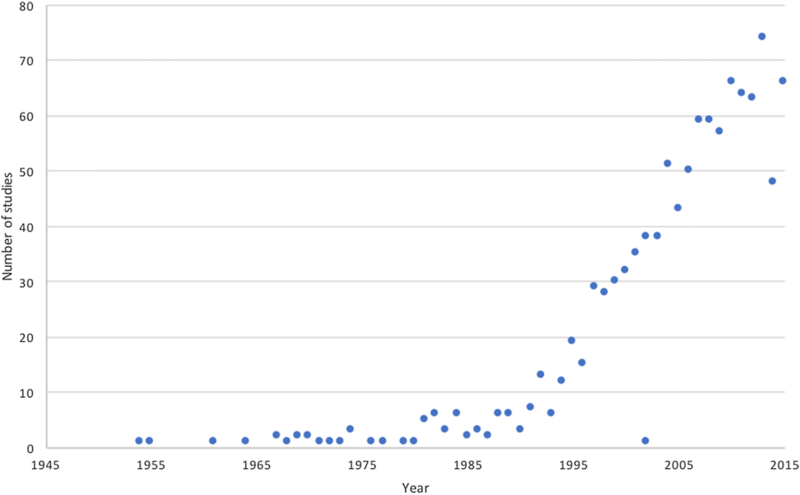 Whilst many other systematic reviews and maps have identified exponential growth in research publications over recent decades [73–75], publication rates within the topic of this review appear to be more linear, increasing from a minimum of approximately 5/year in 1990 at the rate of c. 2.7 studies per year from that point onwards. This suggests a more stable growth in research on the topic. Out of 1072 studies within the systematic map, the majority of studies come from North America (n = 393, 37%) (Fig. 8), with most of these coming from the USA (n = 341). Of these US studies, many were undertaken in Iowa (n = 70), North Carolina (n = 40), Missouri (n = 33) and Mississippi (n = 27) (Table 3). After the USA, the UK was most commonly studied (n = 213). The country with the third highest number of studies was France, with 64 studies. More studies were observational (i.e. quasi-experimental) (n = 660) than manipulative (i.e. experimental) (n = 406), with only six studies combining observation and manipulative designs. It is worth noting that reviewers identified a spectrum of study designs between purely observational studies and purely manipulative ones: these studies may have used observational methods to investigate a prior manipulation. This was common in long-term experiments. Figure 9 shows the duration of studies included in the systematic map database. Around two-thirds (n = 710) of studies were only 1 or 2 years in length, with very few studies lasting longer than 10 years (n = 23). 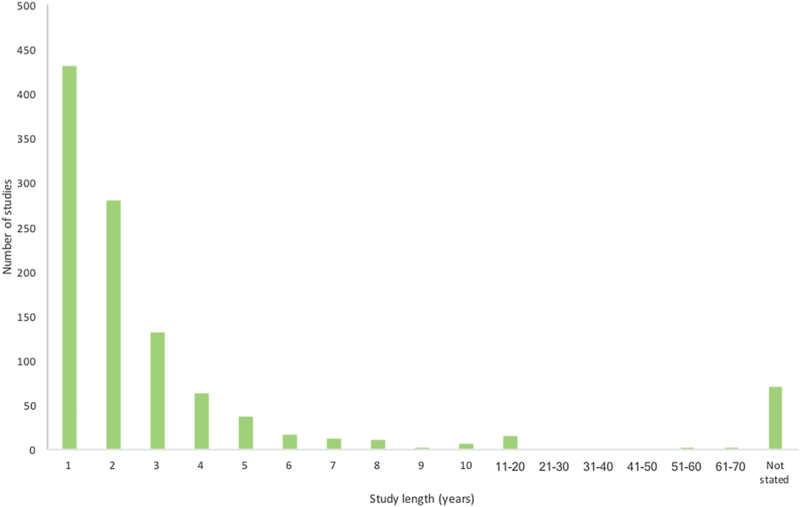 A large number of studies did not report their study length (n = 70). 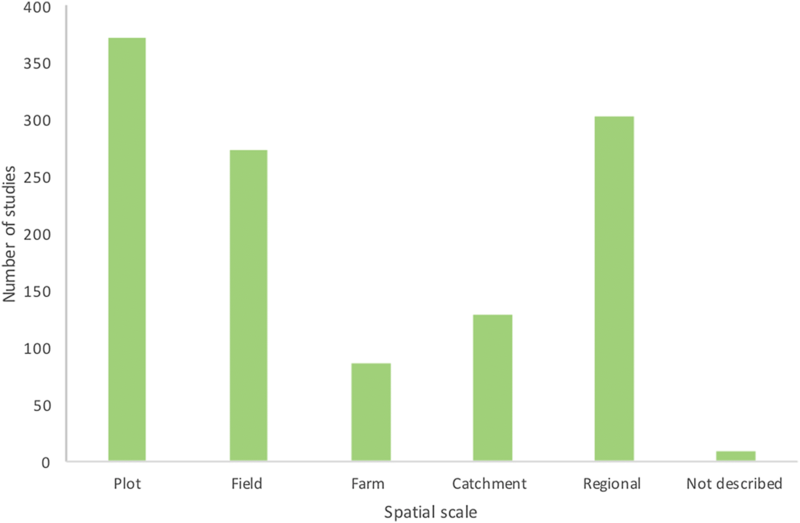 Study spatial scale is shown in Fig. 10, showing that studies were fairly evenly distributed across plot-, field- and regional-scales. Farm- and catchment-scale studies were less common, with only a minor proportion not describing the scale. However, the distinction between catchment and regional is questionable. Following screening, reviewers noted that spatial scale was not easy to code and often overlapped. This may result in confusion when (1) different levels of organisation are characterised by a variety of processes that have their own scales of space and time, (2) replication is low and plot size is large and (3) comparisons are made among samples that are not independent (i.e. pseudoreplication). The distinction between catchment and regional is therefore unlikely to be a useful one. It was most common for measurements within studies to be conducted across two quarters (n = 392), followed by only one quarter (n = 225). Considering the timings specifically, measurements were most commonly taken over the spring and summer (Q2 [April–June] and Q3 [July–September], n = 272), with studies spanning the whole year the next most common time period (n = 171) (Table 4). Most studies investigated the change in an outcome from within a field into or across a vegetated strip (n = 472) (Fig. 11). Some 344 studies investigated the impact of the presence of a strip or strip management relative to a control site lacking a strip, or to the same system before the change was put in place. A similar number of studies (n = 329) investigated differences in outcomes resulting from strips of different vegetation. Only 5 studies failed to describe the intervention in detail. A large proportion of the evidence base did not report the duration of the intervention (i.e. the time period that the vegetated strip or management practice was in place) (n = 592). Of those reporting duration, a third of the studies were 10 years or less since establishment of the vegetated strip or strip management (n = 366). The most common duration over which strips or strip management were in place was 2 years (Fig. 12). 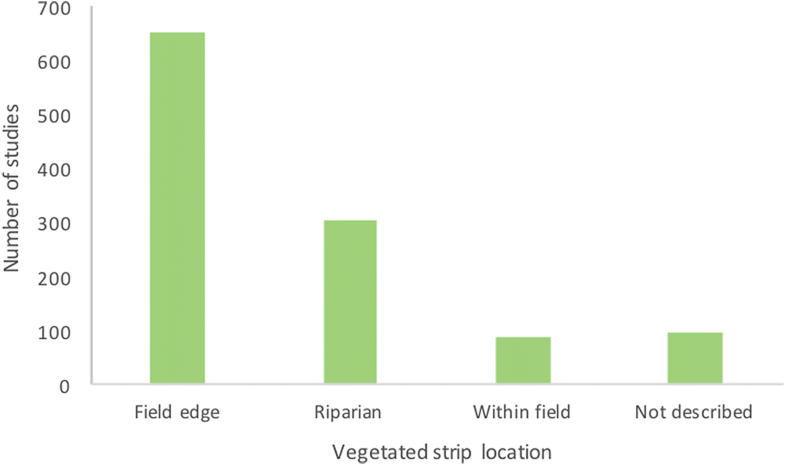 Field edge vegetated strips were most common (n = 651), followed by riparian strips (n = 304), and very few within-field strips (n = 86) (Fig. 13). A total of 96 studies did not report strip location: this was common for studies examining strips as pollutant filters in a manipulative design, where the experimental filter trips were placed fully within a field. Grasses were the most common type of vegetation in strips (n = 530), followed by trees (n = 354) (Fig. 14). Many other strips had a combination of vegetation or other groups of plants (n = 295), perhaps indicating the need for more specific coding. 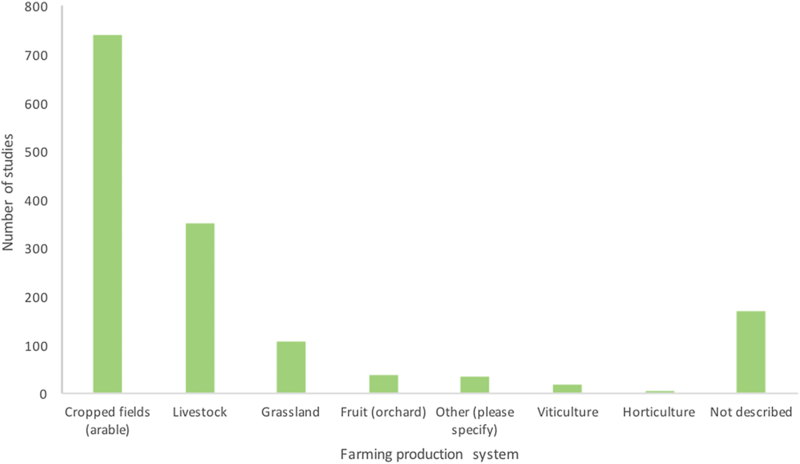 The majority of studies were performed in arable systems (n = 738), followed by livestock (n = 351) (Fig. 15). 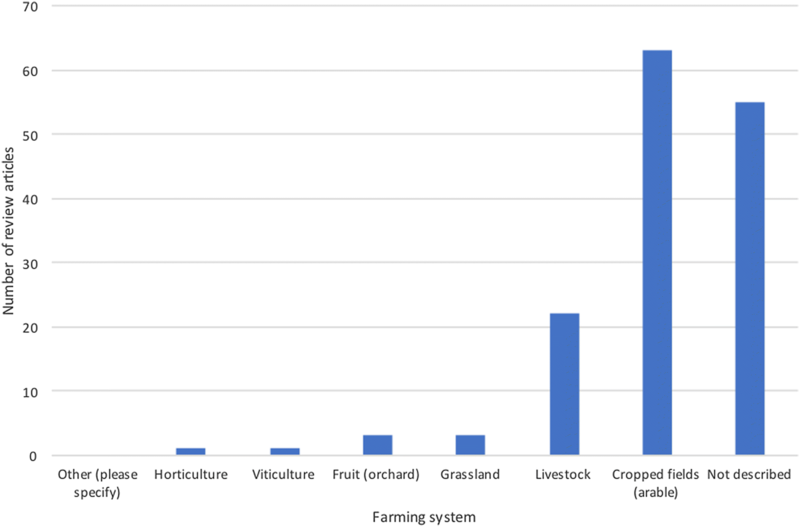 Many studies did not describe the farming production system (n = 168). Management of strips was generally not described across the evidence base (n = 513), but where descriptions existed they related to sowing or planting of vegetation in strips (n = 394), cutting of strip vegetation (n = 214), a lack of management (n = 110), and other less common practices (see Fig. 16). The most commonly measured outcome across the evidence base was terrestrial biodiversity (in all cases some surrogate measure of biodiversity was used) (n = 596), which was almost three times more common than the second most common outcome, nitrogen nutrients (n = 201). Following this, over 100 studies quantified the following outcomes: water loss/retention (n = 183); phosphorus nutrients (n = 140); soil chemical (n = 123) and physical (n = 107) characteristics; and pest control (n = 104). Social impacts of vegetated strips were not commonly investigated: social, n = 19; farming economics, n = 15; and, recreation, n = 9 (Fig. 17). Table 5 displays the number of studies in which multiple outcomes were reported together. Commonly co-occurring outcomes (i.e. n > 50 studies) were: biodiversity (terrestrial) and pest control (n = 61) (although many pest control outcomes were also measures of diversity); nutrients N and nutrients P (n = 99); nutrients N and soil soil/sediment (chemical not N/P) (n = 75); nutrients N and water loss/retention (n = 86); nutrients P and water loss/retention (n = 56); soil loss/retention and water loss/retention (n = 56); and, soil/sediment (chemical, not N/P) and soil/sediment (physical) (n = 53). The most common groups of ecosystem services were regulating services (n = 1119), followed by supporting services (n = 836) (Fig. 18). 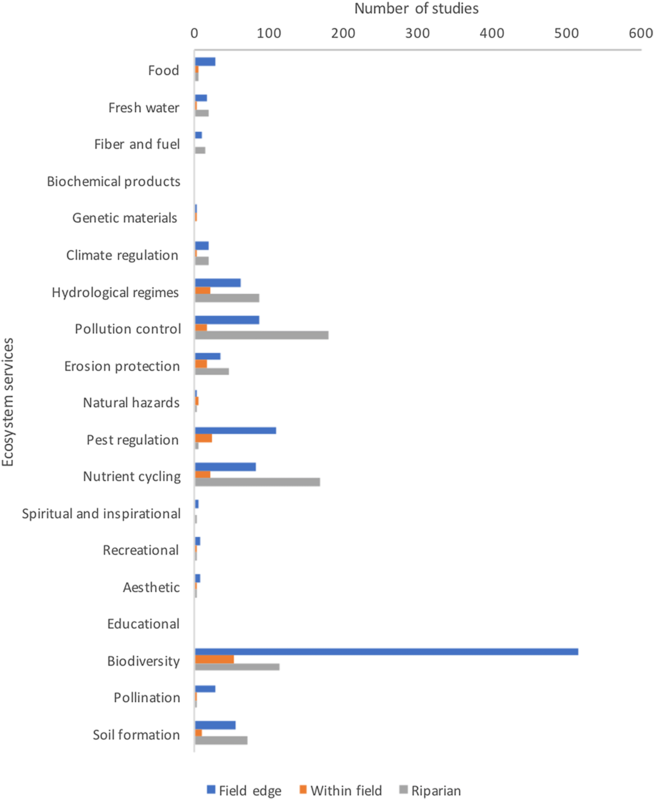 The most frequently reported single ecosystem service was biodiversity (n = 662), followed by pollution control (n = 313) and nutrient cycling (n = 297). Under-reported ecosystem services were: all provisioning services (food, fresh water, fibre and fuel, biochemical products, genetic materials); climate regulation; natural hazards; all cultural services (spiritual and inspirational, recreational, aesthetic, educational); and pollination. It is worth noting, however, that some studies may have focused on pollinators without describing them as such, and this may result in under-representation of research on this topic. Figure 19 displays how studies of the various ecosystem services have increased in frequency over time. There are no clear trends, with all services increasing in representation over time in a similar way. Ecosystem services reported in studies differed depending on the location of the vegetated strip (Fig. 20), with riparian strips more commonly associated with fresh water, fibre and fuel, hydrological regimes, pollution control, erosion protection, nutrient cycling, and soil formation services than average. 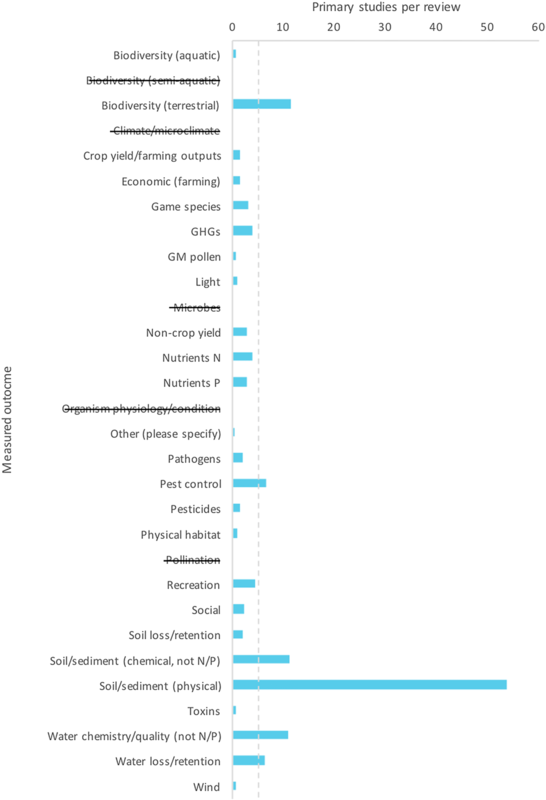 Conversely, field margin strips were more commonly associated with food, genetic materials, pest regulation, spiritual and inspirational, recreational, aesthetic, biodiversity and pollination services than average. 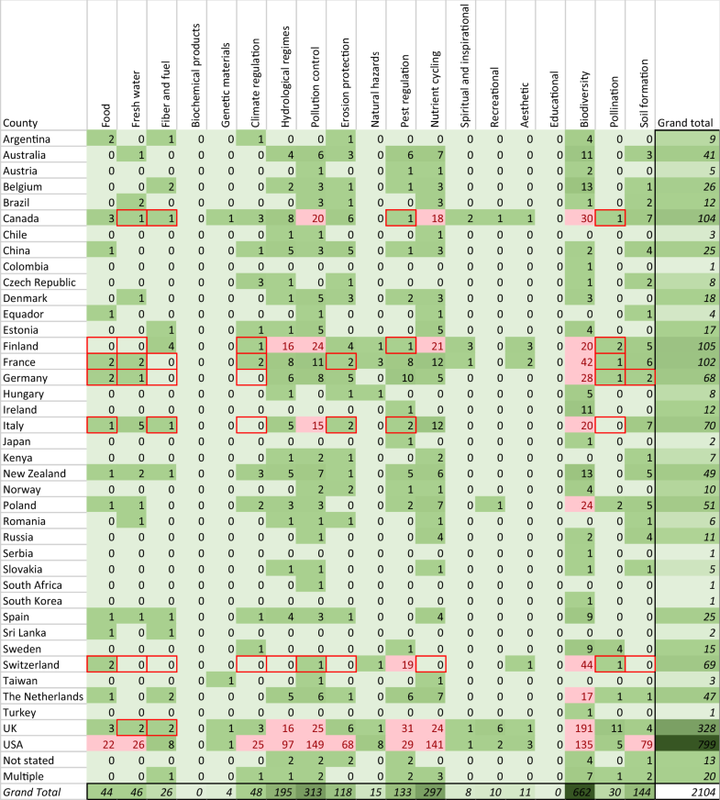 When comparing ecosystem services studies within each country (Table 6), some pairs of countries and services can be highlighted as knowledge gaps (underrepresented by primary studies) and some as synthesis gaps or knowledge clusters (many studies, possibly permitting further synthesis in a meta-analysis or similar). There may exist more, important knowledge gaps in the evidence base for each country, but these other gaps would reflect larger gaps in research across each country in general. Table 7 shows that different vegetated strip locations were the focus of different ecosystem service measurements. Particularly noticeable is the high level of research into biodiversity measurements in field edge vegetated strips (and within field strips to a lesser extent), whilst this is less common in riparian strips. There is also an expected focus on pollution control and nutrient cycling in riparian strips. Research on pollination services and pest regulation in riparian strips is perhaps lacking. A total of 130 reviews were identified through screening. These are outlined in a reviews database that can be found in Additional file 7. Across the reviews, 153 different main terms (i.e. the predominant term used in each review) were used to describe vegetated strips (see Table 8). The most frequently used term was shelterbelt (n = 19), followed by field margin (n = 15), riparian buffer (n = 14), windbreak (n = 14), and hedgerow (n = 13). 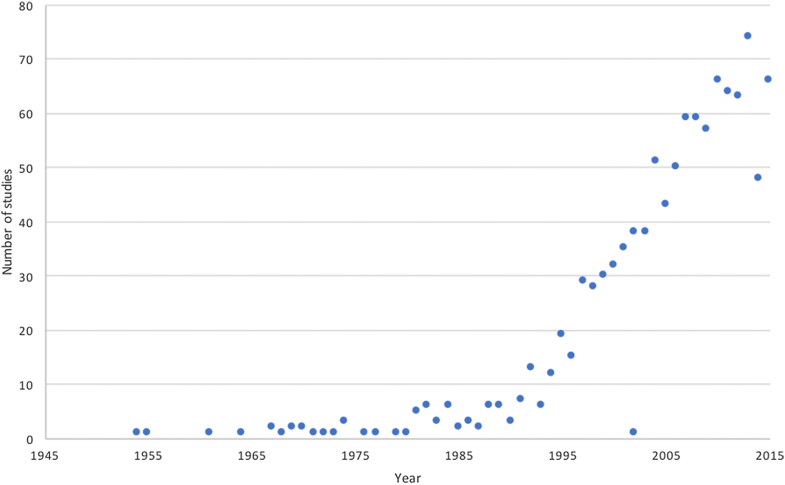 The number of reviews has increased roughly linearly since the 1980s (Fig. 21), with around a third of these reviews published in the last 10 years (n = 43). The use of individual terms varies over time (Table 9), with several terms clearly more historically used than others (i.e. hedgerow, shelterbelt and windbreak) perhaps with some of these also becoming less commonly used (i.e. shelterbelt and windbreak). 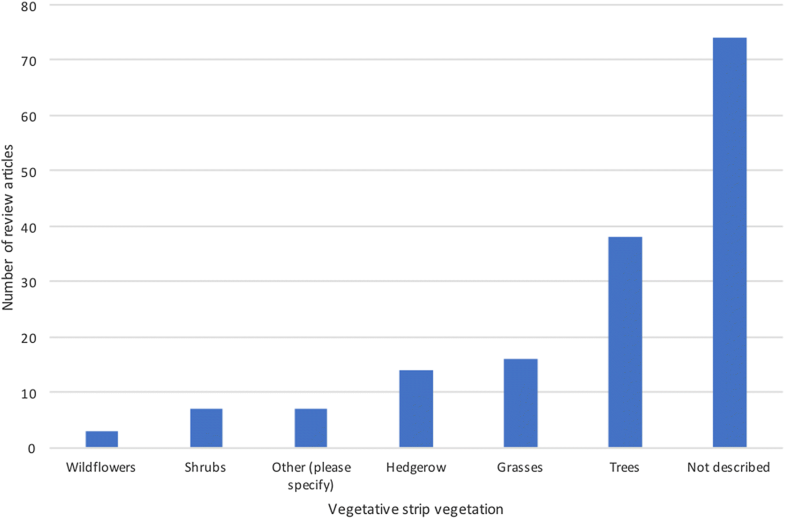 Of the 130 relevant reviews that we identified, the majority had a primary focus on vegetated strips (n = 84), whilst 46 reviews mentioned vegetated strips as a secondary topic. 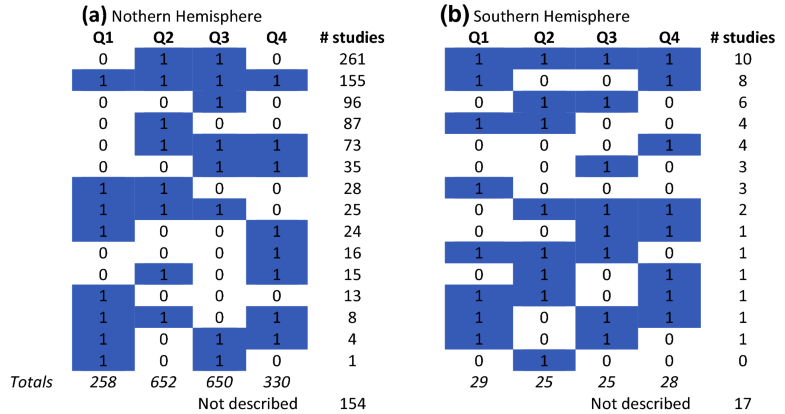 Most reviews were not specific to a geographical region (n = 99), with only 30 reviews focusing on specific locations or regions: the most frequently referenced were the USA (n = 9) and UK (n = 4) (Table 10). The vast majority of reviews were narrative (n = 107), with a small number of theses (n = 7), quantitative reviews (i.e. meta-analyses or similar) (n = 11), and reviews that were to some extent systematic (i.e. a documented search and/or screening phase) (n = 7). One review was a quantitative systematic review and one was a quantitative narrative review. Approximately half of the reviews referred to arable farming systems (n = 63), with livestock farming being the second most commonly studied system (n = 22); 55 reviews did not specify the system considered (Fig. 22). Horticulture (n = 1), viticulture (n = 1), orchard fruit systems (n = 3) and grasslands (n = 3) were also represented. Most reviews did not specify the vegetation type within the described strips (n = 74), but trees were most commonly described (n = 38) (Fig. 23). 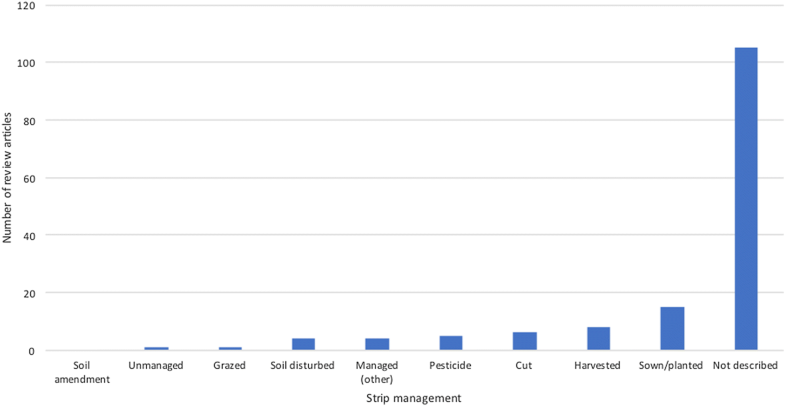 The majority of reviews did not report management of strips (n = 105), with sowing and harvesting reported in 15 and 8 reviews, respectively (Fig. 24). The vegetated strips described in reviews were mostly riparian (n = 53) or at the field edge (n = 45), with a smaller number of in-field strips (n = 18) and 50 strips with no specified location. The interventions most commonly described were the presence of vegetated strips (n = 114), with many studies examining the change in an outcome across the strip from within the field to outside the strip (n = 82) (Fig. 25). Strip dimension (i.e. width) and vegetation type were also moderately common (n = 28 and 23, respectively). Figure 26 displays the outcomes that were reported to be affected by vegetated strips. The most commonly measured outcomes were nutrients (N), terrestrial biodiversity and nutrients (P) (n = 53, 52 and 52, respectively). Of these, 19 reviews considered terrestrial biodiversity and both nutrients (N) and (P). Nutrients (N) and (P) were reported together in 44 reviews. Least commonly measured were impacts on soil physical characteristics (n = 2) and recreation (n = 2), with social impacts, pathogens, non-crop yield, physical habitat, water chemistry, light, greenhouse gasses, game species and genetically modified pollen being measured in fewer than 10 reviews each. The most common ecosystem service described in reviews was pollution control (n = 70), followed by biodiversity (n = 51) and erosion protection (n = 47) (Table 11). Cultural ecosystem services were poorly represented (n = 14 in total). Across primary studies and reviews, the most common terms were similar; the four terms ‘field margin’, ‘hedgerow’, ‘shelterbelt’, and ‘riparian buffer’ were all in the five most frequently cited terms for both databases. 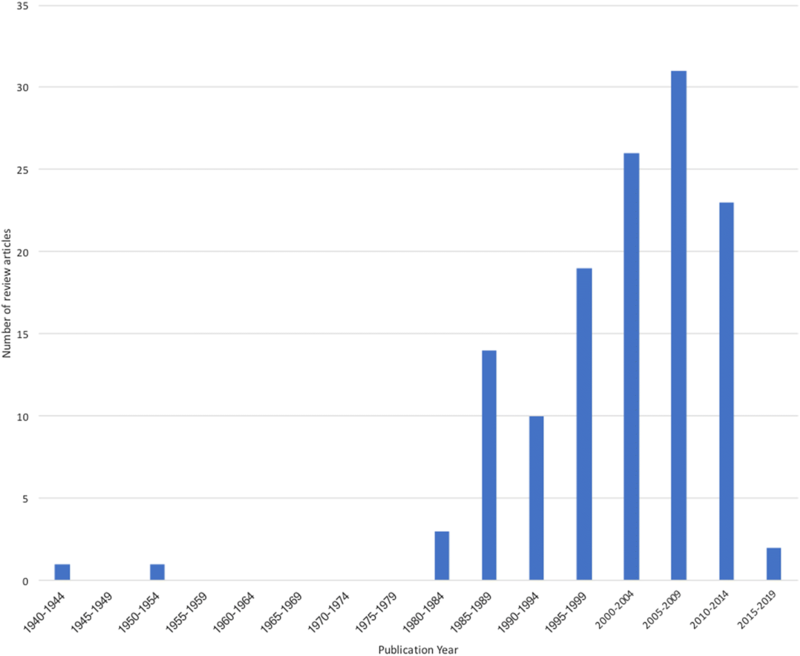 The publication rate of primary studies and review articles is similar (Fig. 27), although there is a relative reduction in the number of reviews over the past 10 years, whilst the number of primary research articles continues to increase linearly. 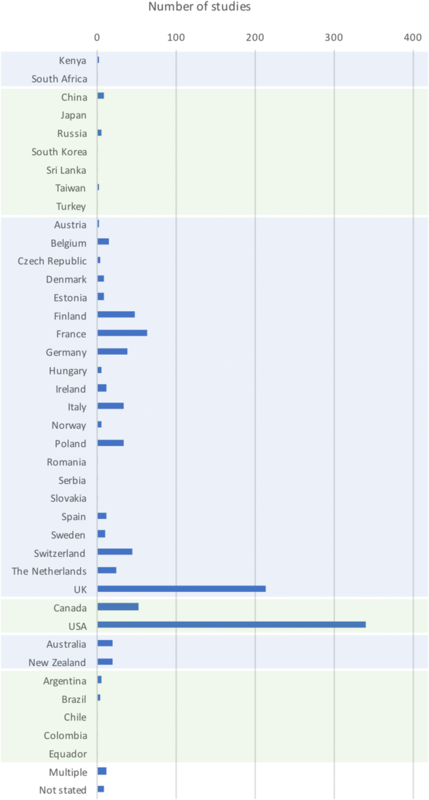 The most frequently investigated countries in primary research were the USA and UK, and this pattern was reflected in the subset of reviews that focused on a specific location. Approximately half of the reviews focused on arable farming, whilst this system was investigated in almost 70% of primary studies. Reviews did not often mention vegetation type, probably because they included relevant studies with any vegetation type, whilst grasses were most commonly reported in primary studies. Strip management was infrequently described in both reviews and primary studies. Around half of vegetated strips in primary studies were field edge and a quarter were riparian, whilst riparian and field edge strips were roughly equally the focus of around a half of all described strips in reviews. 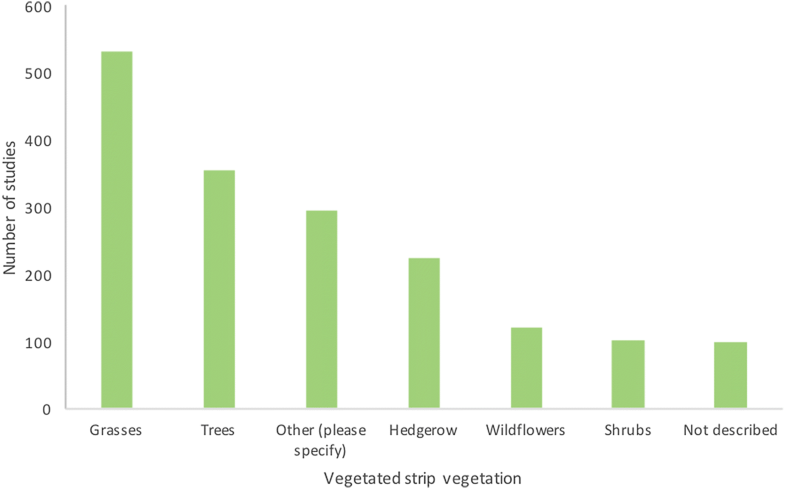 Strip presence and comparisons between strips and field environments were the most common types of comparison in both primary studies and reviews, whilst vegetation type was the focus of around a quarter of primary studies, but only 17% of reviews. Some 22% of reviews focused on the impact of vegetated strip width, whilst only 14% of primary studies investigated this factor. Primary studies and reviews generally prioritised similar sets of outcomes (i.e. terrestrial biodiversity, nitrogen and phosphorus nutrients, soil and water loss or retention). However, several outcomes, including wind, pesticides, and crop yield, were the focus of a substantial number of reviews despite being relatively poorly represented in the primary literature. Overall there were 5.4 primary studies per review article identified and catalogued within this project. Figure 28 displays the primary study: review article ratios for all reported outcomes. Studies with ratios greater than the average indicate that further synthesis may be a priority. Outcomes with lower ratios are not necessarily well-synthesised, however, since the total number of primary studies measuring these outcomes may be low. The mean number of primary studies per review across all ecosystem services was 6.6, with higher values (lower numbers of reviews relative to primary studies) for several regulating services (natural hazards, pest regulation, and nutrient cycling) and supporting services (biodiversity and soil formation) (Table 11). Despite having more than the average number of primary studies per ecosystem service (x ̄= 17.6), hydrological regimes, pollution control, and erosion protection were relatively under-represented in terms of syntheses, representing a possible synthesis gap. We have found a substantial body of evidence investigating and reviewing the various impacts of vegetated strips. It seems that the publication rate of primary research continues to increase, beyond that of synthetic research that reviews this work. It is unsurprising that research on the topic continues to increase in popularity. Countries such as the UK, Denmark, The Netherlands, the USA, Sweden, and New Zealand, amongst others, are moving towards targeted regulation of nutrient losses from agricultural fields. As a result, there is a strong incentive to understand how vegetated strips can be used to remove N and P through both simple and more advanced technologies, including saturated buffers, intelligent buffer zones, etc. [31, 76]. Most studies last only a few years and vegetated strips or strip management were in place for a similar length of time before being studied. Studies most commonly compared vegetated strips to conditions within a field, followed by conditions in fields without strips or different strip vegetation. Field edge strips were most frequently studied, followed by riparian strips. Strip vegetation was most commonly grasses, then trees. The most common farming system studied was arable fields. The management of strips was generally not described, but beyond planting or sowing to establish the strip, cutting was the most common management practice that was mentioned. 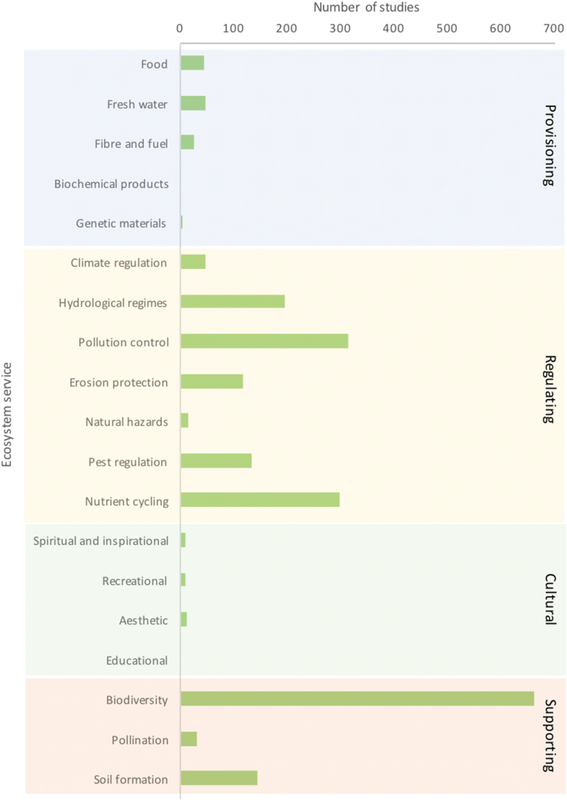 Terrestrial biodiversity was the most frequently measured outcome, followed by nitrogen, water loss and phosphorus, but a suite of other outcomes was also reported in the evidence base. Across all outcomes, the most commonly identified ecosystem services related to biodiversity, pollution control and nutrient cycling. It is notable that more than half of the studies in the primary studies systematic map database originate from either the USA or the UK (38 and 16% of total studies, respectively; Fig. 8). For comparison, Canada, France and Finland each contribute c. 5% of the total number of studies, and no other countries contribute more than 3% of the total. Research from the USA is itself strongly skewed, with 20% of studies undertaken in Iowa and a further 30% in North Carolina, Missouri and Mississippi combined. The reasons and implications for these geographical biases in the dataset are worthy of consideration in synthesising the data to inform policy. There is also geographical bias in the study of particular ecosystem services (Table 6). Biodiversity is the most studied service (31% of total studies) and there are marked variations across the evidence base, with biodiversity investigated in 17% of US studies, but in 58 and 64% of studies in the UK and Switzerland, respectively. These differences most likely relate to differences in national frameworks for the protection of biodiversity [77–79]. Studies of nutrient cycling, hydrological regime, and pollution control were relatively evenly spread geographically, whereas erosion protection is a particular focus for studies in China (20% of total studies compared to 6% for studies from all countries combined). Pest regulation is a particular focus in Switzerland (28% of total studies), and with a wide range of authors, this appears to be a specific concern in this country rather than disproportionate impact from a single research group. Figure 16 shows that studies investigating certain ecosystem services are often strongly associated with a specific type of vegetated strip. For example, studies into effects on biodiversity, pest regulation and pollination focus predominantly on strips at the field edge rather than either in-field or riparian strips. In contrast, studies into pollution control and nutrient cycling tend to consider riparian strips. There are very few studies that consider more than one strip location (field margin vs. in-field vs. riparian), so there is a strong possibility that this association between ecosystem service studied and strip type is influenced by existing practice and concepts rather than clear evidence that a particular strip location is optimal for a specific ecosystem service. In-field strips have been shown to be highly effective in control of erosion and associated transport of pollution through inhibiting the formation of concentrated flow pathways ; nevertheless, strips that are studied for this purpose are overwhelmingly either riparian or at the field edge (Fig. 16). Overall, there are very few studies that consider in-field vegetated strips, presumably because this is the most difficult strip type for farmers to implement. 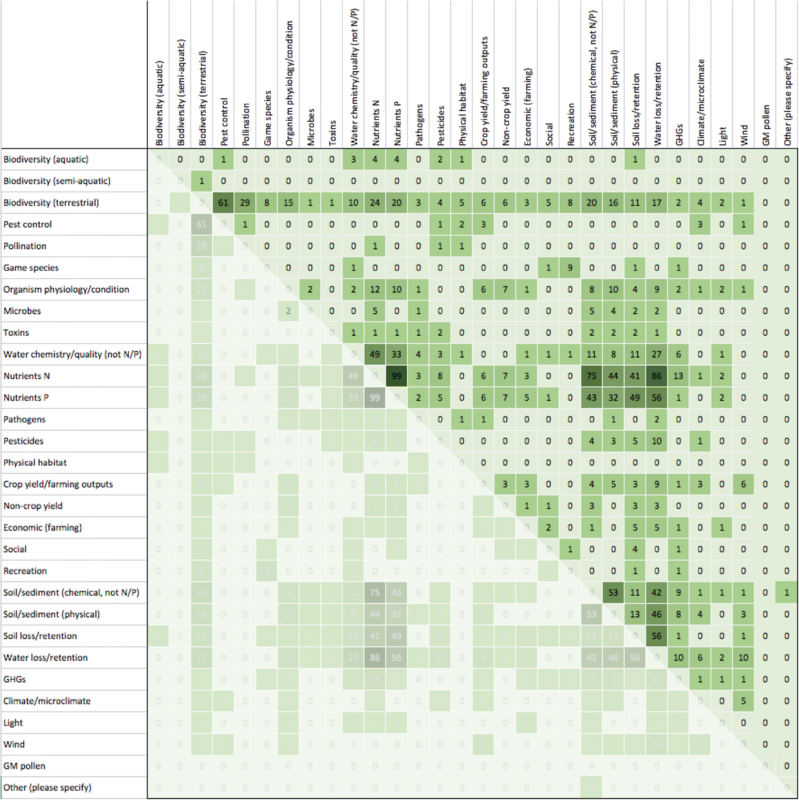 The review has identified 30 different measured outcomes across 19 ecosystem services. Although vegetated strips may be implemented for a specific function, their design and management may influence their ability to support other ecosystem services . In most cases, where authors studied multiple outcomes (Table 5), they were closely related; the most common of these were the nutrients N and P (where 99 studies reported on both), followed by N and water loss/retention (85 studies). Many pest control and pollination outcomes (61 and 31 respectively) were reported together with biodiversity, but this is largely because these outcomes, such as species abundance, are also a feature of wider biodiversity. 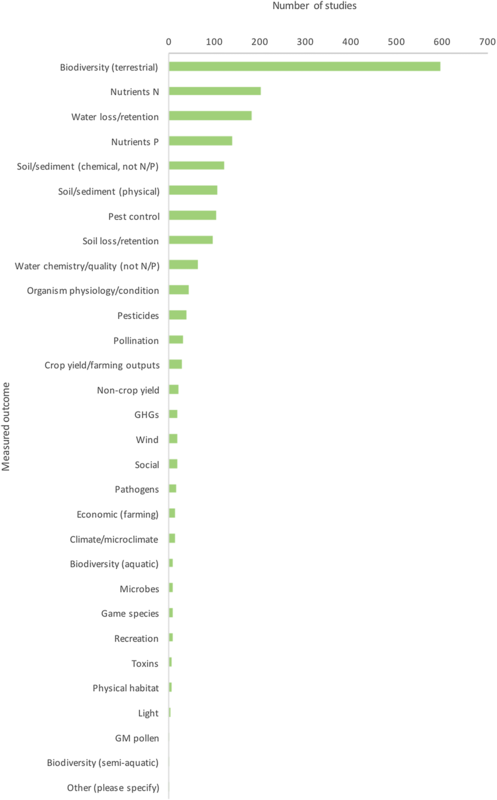 Studies that looked at more contrasting ecosystem services were less common, but biodiversity and nutrients were notably studied together in a number of studies; nitrogen (24 studies) and phosphorus (20 studies). Similarly, biodiversity was co-measured with a variety of soil outcomes. These studies often considered the soil or plant communities associated with soil or nutrient outcomes, but a few did consider wider biodiversity, such as Stockan et al. , who studied carabid species together with outcomes related to soil and water nutrients. The intensification and expansion of agriculture means that both quantity and quality of off-crop habitats, such as vegetated strips, are likely to be increasingly important in supporting a wide variety of ecosystem services , and further primary studies into the value and enhancement of multifunctional services offered by vegetative strips would be useful. We searched for evidence using a suite of synonyms for vegetated strips that included 360 search terms, of which only 84 were represented in the evidence base, representing a very sensitive approach. We also undertook extensive bibliographic searching, screening the reference lists of almost 100 relevant literature reviews. This supplementary searching was vital to identify articles that might have used other synonyms for buffer strips that were identified in the evidence base. However, there is a risk that some studies using less common synonyms may have been missed from the database and bibliography searches. Future updates or amendments to this topic should integrate the synonyms that we identified into new searches to minimise this risk. Additionally, our organisational website searches for grey literature were focused more on European contexts, given the experience of the review team. We did attempt to include non-European organisations, but future work could direct effort particularly towards organisations in the USA, where a great deal of evidence was identified by our work. Finally, we were unable to source 276 papers due to a lack of subscription. We used subscriptions across several institutions, including Stockholm University and SLU, which are together relatively comprehensive, but evidently not completely so. Future work could attempt to source these difficult to access articles. Missing meta-data was a consistent issue with a small number of studies, even with basic information, such as the study country (n = 8). Occasionally high levels of missing meta-data at times reflect the study topics: for example, 592 studies did not report the intervention duration, but this is perhaps to be expected with field margins and hedgerows that may have been in place for extensive periods, and this information may be unavailable. Other meta-data is surprising in its absence: for example, 99 studies did not report the type of strip vegetation and 168 studies did not report the type of farming system investigated. We echo previous calls for improved reporting to facilitate synthesis and repeatability [e.g. 84, 85]. The publication rate of primary research studies on this topic can perhaps be considered to deviate from common patterns in other systematic reviews [e.g. 86] in that there is an abrupt change in rate from the late 1980s and a steady, linear increase in papers thereafter. Other reviews suggest a more exponential growth rate. 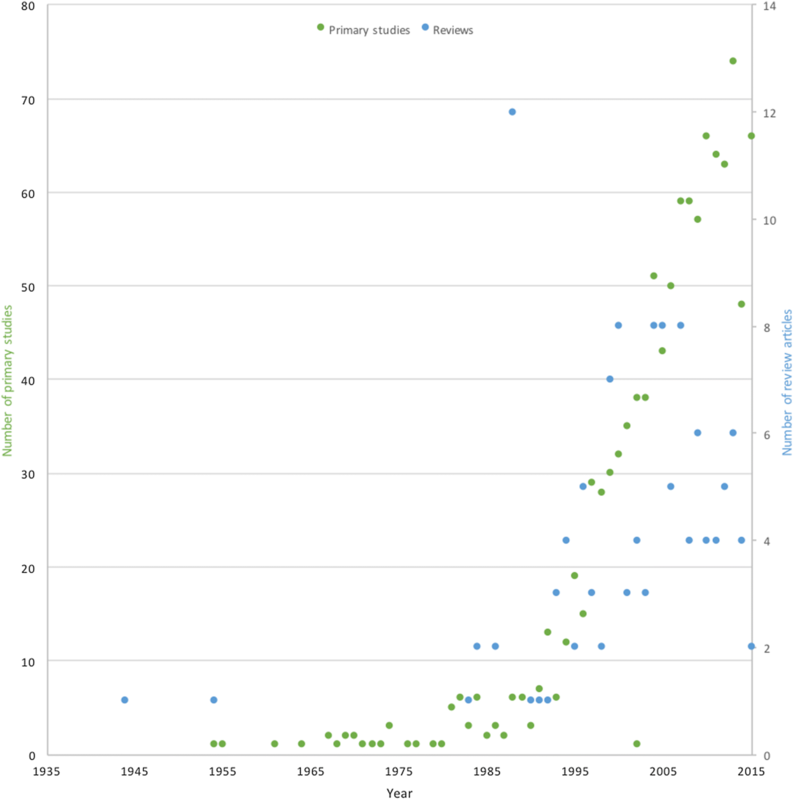 This difference possibly reflects the fact that this topic is broader than many other systematic reviews (and some maps) to date, or that there was some shift in research funding during the late 80 s that has remained in constant growth since. To date, the evidence bases used in national level policy settings have often been drawn from national level research evidence, which can be restricted in nature, showing only one or a limited number of outcomes or ecosystem services and including a narrow set of contexts. These evidence bases may not cover the multi-functionality and potential goal conflicts of vegetated strips that can be identified through a regional or global assessment of evidence, such as the one presented here. The systematic mapping approach outlined herein along with associated systematic review methods (collectively referred to as evidence synthesis methods) are a reliable, transparent and comprehensive means of identifying and characterising knowledge gaps and clusters relating to a particular topic. In this case we have utilized international evidence from all relevant climate zones to assemble an extensive, comprehensive evidence base that investigates a plethora of contextual features. This evidence base is vital for making the best use of available evidence in national (and other) policy-making. The expertise of the author team is European focused, and as such we are unable to discuss in detail North American policy, and focus instead on EU policy, with which we are most familiar. The experience from Denmark with the Buffer Zone Act adopted in 2011 that implemented 50,000 ha of 10 m wide mandatory buffer strips along all watercourses and lakes is an illustrative example of the need for reliably synthesised evidence . The Buffer Zone Act was revised after 3 years, halving the area of buffer strips following boycott by farmers and several lawsuits. Finally, the Buffer Zone Act was withdrawn in 2016 as part of the main goals of the new Danish government. An evidence synthesis on the topic would have greatly assisted in this instance, since the production of evidence on ecosystem services from across an international evidence base would likely have been influential in the debate. The following topics represent knowledge gaps where no studies exist or a relatively small number of studies have been conducted. The review team feel that these topics are important social or ecological issues that warrant further investment in terms of research funding and primary research efforts. What role can vegetated strips play in climate regulation? 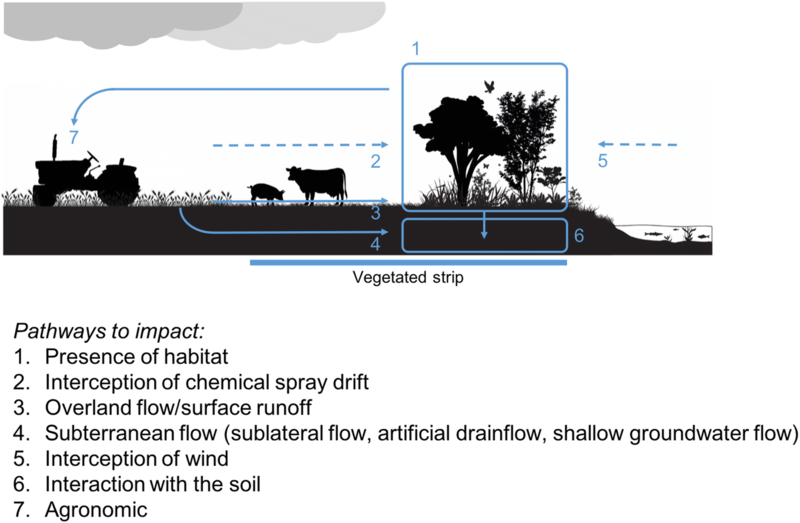 What are the impacts of vegetated strips on aquatic and semi-aquatic biodiversity? What are the impacts of harvesting strip vegetation on all outcomes? What are the possible cultural ecosystem services (spiritual, recreational, aesthetic, educational) of vegetated strips? What are the long-term impacts (> 2 years) of vegetated strips, and how do impacts vary over time or measurement season. What is the relationship between the presence of pests or predators of pests and the impacts of vegetated strips on crop yield and weed seed bank in soil of nearby agricultural fields? What is the role of vegetated strips in terms of fibre and fuel production in a circular bioeconomy? What are the impacts of vegetated strips on all outcomes from the following un- and under-represented countries and regions, including: eastern Europe; Russia; Asia; South America (specifically, Argentina, Brazil, Chile and Uruguay)? What are the characteristics that improve multiple outcomes in multi-use vegetated strips (i.e. those designed to have many different social-ecological benefits)? To what extent does the implementation of multiple interventions targeting different outcomes lead to synergies or conflicts? The following topics represent knowledge clusters that the review team believes are important topics for researchers and decision-makers for further synthesis (approximately ordered by volume of evidence). We have used an arbitrary cut-off of a minimum of 40 studies to be mentioned below, acknowledging that heterogeneity amongst studies is likely to preclude meaningful synthesis for small numbers of studies. Since we have not conducted critical appraisal, we are unable to prioritise the suitability of these clusters for synthesis. How do vegetated strips affect terrestrial biodiversity (n = 596)? What are the impacts of different vegetated strips on nutrient (nitrogen and phosphorus) retention (n = 242)? OR How effective are vegetated strips at reducing nitrogen losses to water and air (n = 212)? What are the impacts of vegetated strips on hydrological regimes (n = 195)? What are the impacts of buffer size or width (n = 154) on biodiversity (n = 88), nitrogen nutrients (n = 25), phosphorus nutrients (n = 27), soil loss/retention (n = 25), soil chemistry (n = 14), and water loss/retention (n = 35)? 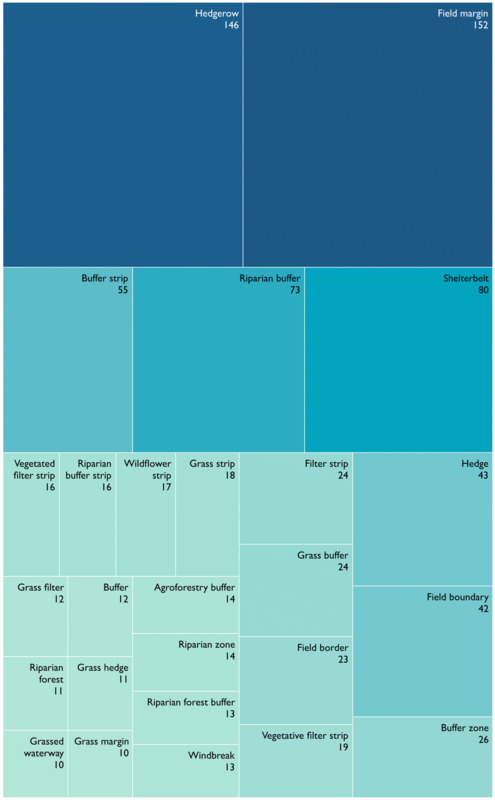 What are the impacts of vegetated strips on sediment-associated chemicals, including priority substances under the EU Water Framework Directive (n = 123)? What are the impacts of vegetated strips on erosion protection (n = 118)? What are the impacts of vegetated strips on pests in arable fields (n = 104)? What role can vegetated strips play in terms of carbon sequestration (n = 87)? How do soil physical/chemical characteristics of vegetated strips affect terrestrial biodiversity? Specifically, the what is the link between: terrestrial biodiversity and nutrients (n = 29); terrestrial biodiversity and physical characteristics of the soil (n = 10)? How do different types of strip affect biodiversity (n = 42)? : for field edge versus riparian strips (n = 23); for in-field versus field edge strips (n = 19)? In conclusion, this systematic map highlights a large and heterogeneous evidence base relating to the impacts of vegetated strips in boreo-temperate agriculture, containing a suite of knowledge gaps and knowledge clusters. Further research effort, both in terms of primary studies and syntheses, is necessary to understand these diverse impacts of the various types of vegetated strips, particular in understanding: (1) the role of landscape context in the effectiveness of vegetated strips; (2) potentially conflicting outcomes between different management options; and (3) conflicts between high production targets and environmental objectives. This review was conducted by NRH, JE and JJ. The report was drafted by NRH. All authors assisted in editing and revising the draft. All authors read and approved the final manuscript. The authors thank Nichlas Staberg and Fillippa Ek for assistance with article retrieval and meta-data extraction. The authors declare that they have no competing interests. Efforts were made to ensure that authors of research studies included in this review were not involved in any decisions regarding their own work. For Finnish studies, however, this was not possible, and JUK was involved in screening a small number of studies for which she was an author. Studies were further checked for relevance by NRH following screening, however, and no articles were included that did not meet the review’s inclusion criteria. A list of excluded studies at full text, a list of unobtainable and un-translated articles, a list of relevant reviews and meta-analyses, the systematic map database, and the GIS are included as additional files with this report. This review report is financed by the Mistra Council for Evidence-Based Environmental Management (EviEM). 13750_2018_126_MOESM1_ESM.docx Additional file 1. Search string development. 13750_2018_126_MOESM2_ESM.xlsx Additional file 2. Web-based searching record. 13750_2018_126_MOESM3_ESM.xlsx Additional file 3. Unobtainable articles. 13750_2018_126_MOESM4_ESM.xlsx Additional file 4. List of articles excluded at full text along with reasons. 13750_2018_126_MOESM5_ESM.xlsx Additional file 5. Coding and meta-data extraction schema. 13750_2018_126_MOESM6_ESM.xlsx Additional file 6. 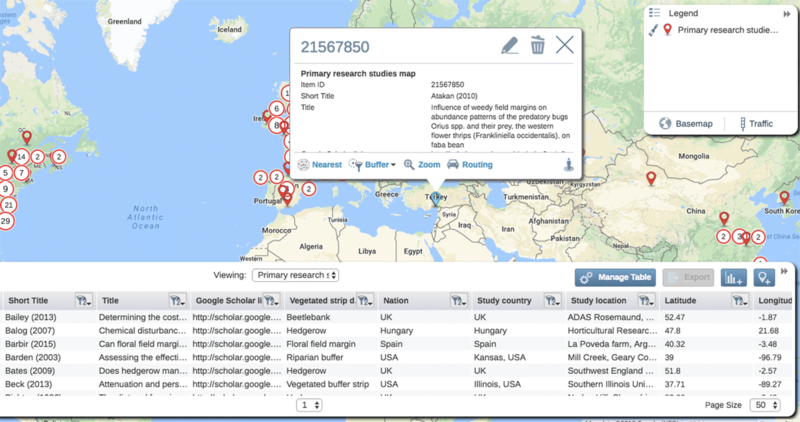 Primary research studies systematic map database. 13750_2018_126_MOESM7_ESM.xlsx Additional file 7. Review articles database. 13750_2018_126_MOESM8_ESM.xlsx Additional file 8. Articles excluded at full text due to language. 13750_2018_126_MOESM9_ESM.xlsx Additional file 9. Term use in primary studies by study location.